A preliminary review of the admissions process at the University of Texas at Austin did not find systemic favoritism, but it did raise enough concerns to prompt the University of Texas System to conduct a broader inquiry. 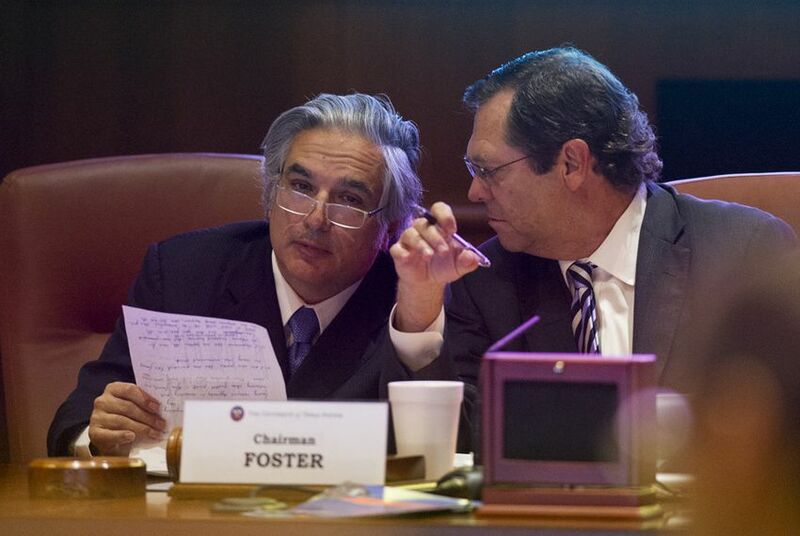 UT System Chancellor Dr. Francisco Cigarroa listens to Board of Regents Chairman Paul L. Foster at the meeting on May 14, 2014. A preliminary inquiry into admissions practices at the University of Texas at Austin found no systemic favoritism among candidates lawmakers had recommended to the university president, according to findings made public Thursday. But the study also found that such students were admitted at a higher rate than the overall acceptance rate. That raised enough concern that UT System Chancellor Francisco Cigarroa will lead a review and revision of all admissions practices at the system's campuses. Questions about favoritism in admissions were initially raised by UT System Regent Wallace Hall, whose personal investigations into the system's flagship university have landed him in hot water. A legislative committee recently approved a motion saying that grounds to impeach Hall exist, and some of his fellow regents publicly called for his resignation at a board meeting on Thursday. Hall has denied any wrongdoing and asserted that he was fulfilling his oversight duties as a regent by looking into issues, including — as his lawyers put it in a letter to the legislative committee — "secret favoritism" at UT-Austin. In their letter, Hall's lawyers cited two examples that the regent had uncovered of lawmakers sending emails regarding the admission of a student directly to UT-Austin President Bill Powers. The inquiry that Hall's concerns prompted ultimately included a review of 16 letters of recommendation written on behalf of students seeking admittance to UT-Austin's law school and 61 recommendation letters for applicants to undergraduate programs that Powers received from 2009 to 2013. Of the 16 law school applicants, eight were admitted. "This, at least, indicates that there was no wholesale admission of everyone recommended by a legislator," wrote the report's authors, Dan Sharphorn, the University of Texas System interim general counsel, and Wanda Mercer, the associate vice chancellor for student affairs. "On the other hand, an admission rate of 50 percent is considerably higher than the approximately 22.5 percent that was the prevailing rate for the general population of Texas resident applications to the school of law during the relevant years." They note that 16 students is too small a sample size to draw firm conclusions, but also wrote that four of the eight successful applicants had lower-than-average LSAT scores. For the undergraduate applicants for whom lawmakers sent recommendations to the president, 58.1 percent were admitted, compared to an admission rate of about 23 percent for the larger pool of students. Additionally, many of the letters of recommendation written on behalf of undergraduate students did not provide significant information about the student or even indicate that the lawmaker knew them. "While analysis of the available data may be challenged and statistical outcomes debated," the authors wrote, "there is one fact that is acknowledged by all: It is common practice for some legislators to submit letters of recommendation for the admission of candidates directly to the UT-Austin president." Since there is no rule against considering such letters in admissions decisions, and no evidence was found of quid pro quo arrangements relating to such decisions or overt pressure to make certain decisions, the report's authors concluded, "it would be hard to claim that there had been misconduct by those involved in the admissions decision-making process." Because these sorts of recommendations have been received from many influential individuals by many presidents of the university over many years, they wrote, "any problems with this practice would seem to be much more a matter of culture than individual misconduct." Cigarroa said the findings raised enough concerns that a systemwide review and revision of admissions policies should be conducted to ensure all universities are using best practices. "In many cases, the first interaction students have with our campuses is through the admissions process," Cigarroa said. "We must get the admissions process right."